Vancouver, BC – Sabina Gold & Silver Corp (SBB.T), (“Sabina” or the “Company”) is pleased to announce continued strong gold intersections from the Nuvuyak discovery at its 100% owned Back River gold project (“Back River” or the “Project”) in Nunavut Canada. Drilling results continue to demonstrate that Nuvuyak has the potential to be a significant new discovery at Back River within the foot print of the currently planned mine infrastructure. The Nuvuyak discovery with drill hole, 18GSE545 which returned 11.58 g/t over 39.50m (see press release August 20, 2018) and 18GSE558 which returned 16.39 g/t over 13.20 meters, (see press release October 22, 2018) is now informed by sectional drilling results from two wedge cuts, 18GSE558W1, and W2 and an overcut with drill hole 18GSE556C. Results confirm the strength of the gold system and importantly, clearly define an anticlinal and structurally thickened oxide iron formation sequence that is of the type preferential for development of large tonnage deposits at Back River. See figure 2 below. Drill holes 18GSE558W1 (Wedge1) and 18GSE558W2 (Wedge2) are wedge holes, which started at between 305m and 356m deep in the parent hole 18GSE558 (Parent). Much like its’ parent, Wedge1 intersected the interpreted limbs of the antiform, and achieved a 25m down plunge separation from the Parent. Drill intercepts include 5.89 g/t Au over 12.70m including 14.83 g/t Au over 4.10m and 7.45 g/t over 4.20m in the East Limb, and 41.56 g/t Au over 1.30m in the West Limb. Wedge2 achieved a much higher separation of 55m which allowed for a cut through the nose of the Lower Iron Formation, and intercepts of 5.81 g/t Au over 34.60m including 40.98 g/t Au over 1.80m and 11.39 g/t Au over 2.65m. Intersections for both Wedge 1 and 2 are approximately 65m southeast of the Discovery intercept in 18GSE545 and thus are up-plunge of it. 18GSE556C lifted higher than intended and drilled above the intended target, crossing intermittent iron formation and argillite along the top of the Lower Iron Formation antiformal structure, an intersection approximately 100m above and 35m down plunge of Discovery hole 18GSE545. Gold intercepts in this overcut include 4.14g/t Au over 2.10m and 4.39 g/t Au over 4.30m. 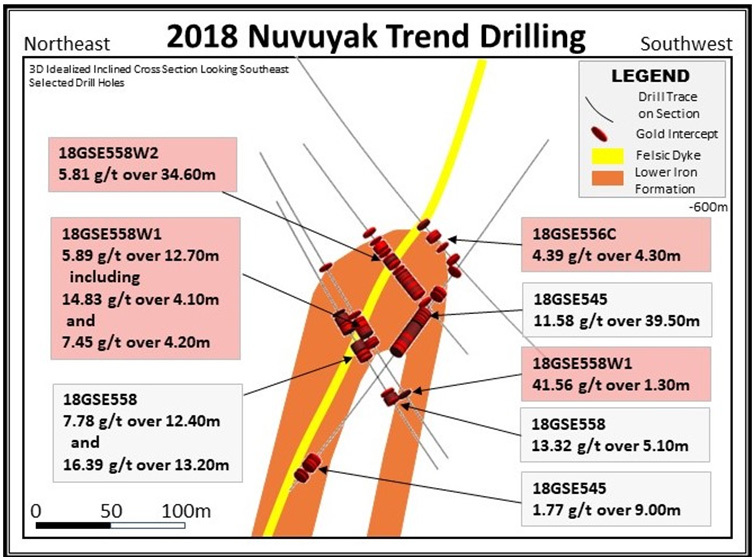 Additional drill hole results from a down plunge portion of the Nuvuyak structure are pending assays and will be released along with results from addition project target areas before year end. 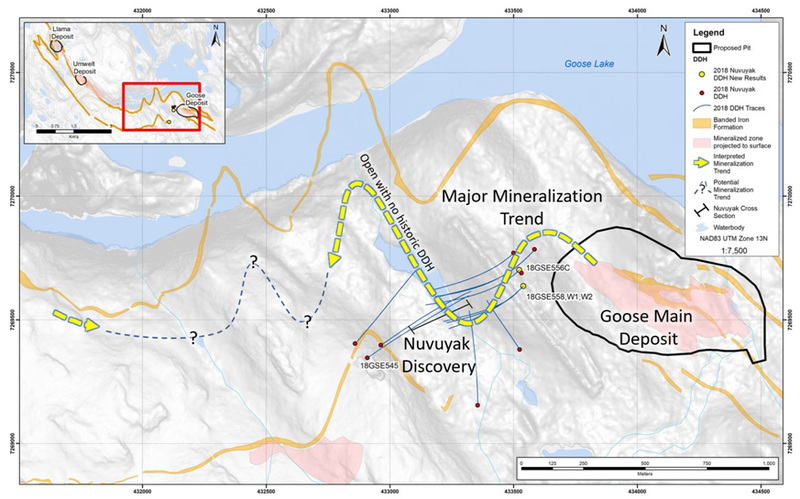 The Nuvuyak gold zone discovery is located approximately 850 meters along strike to the west of the Goose Main deposit (Proven open pit Reserve of 3,266,000 tonnes grading 5.01 g/t totalling 526,000 ounces and an additional Probable open pit Reserve of 1,185,000 tonnes grading 4.98 g/t totalling 190,000 ounces) and approximately 1,000 meters down plunge. The mineralization is hosted within a polyphase folded sequence of the Back River lower iron formation stratigraphy and coincident gold structures that are interpreted as being a significant component of the major mineralizing horizon(s) at the Goose Property. Drilling during 2018 provided further evidence that the felsic dyke at Nuvuyak and Hook is a continuation of the felsic dyke which intrudes parallel to the axial plane of the fold at Goose Main. Felsic dykes at Back River are interpreted to be spatially coincident with major mineralizing structures. In addition, the geometry of the antiform at Nuvuyak is very similar to that of Goose Main, with the folds being nearly isoclinal with a significant thickening in the fold nose. Mineralization consists of arsenopyrite, pyrrhotite and abundant visible gold over broad intercepts that are associated with quartz veining and moderate to strong amphibole and chlorite alteration. Early interpretations of the Nuvuyak zone and its similarities to the high-grade Umwelt Vault zone recognize the potential for a large-scale mineral trend extending from Goose Main to Umwelt Vault that may transect large portions of the central Goose property, much of which is largely underexplored. Sabina Gold & Silver Corp. is well-financed with approximately C$39.4million in cash and equivalents and is an emerging precious metals company with district scale, advanced, high grade gold assets in one of the world’s newest, politically stable mining jurisdictions: Nunavut, Canada. Sabina released a Feasibility Study on its 100% owned Back River Gold Project which presents a project that has been designed on a fit-for purpose basis, with the potential to produce ~200,000 ounces a year for ~11 years with a rapid payback of 2.9 years (see “Technical Report for the Initial Project Feasibility Study on the Back River Gold Property, Nunavut, Canada” dated October 28, 2015) (the “Study”). At a US$1,150 gold price and a 0.80 (US$:C$) exchange rate, the Study delivers a potential after tax internal rate of return of approximately 24.2% with an initial CAPEX of $415 million. The Project received its final Project Certificate on December 19, 2018 and its Type A Water License in November 2017. The Project now has all key authorizations for construction and operations.